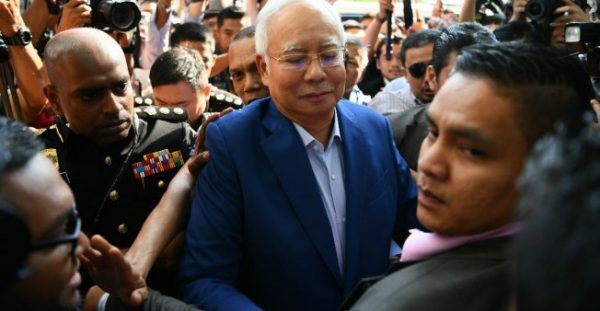 Manan Vatsyayana, AFP | File photo taken on May 22, 2018 of Malaysian former PM Najib Razak arriving at the Malaysian Anti-Corruption Commission (MACC) office in Putrajaya. Former Malaysian Prime Minister Najib Razak was arrested on Tuesday in a stunning fall from grace following a shock election loss in May amid allegations of massive corruption and misappropriation at a state fund he founded. Since his loss at the polls to mentor-turned-foe Mahathir Mohamad, Najib has been barred from leaving the country and had millions of dollars of items seized from properties linked to him as part of the probe into 1Malaysia Development Berhad. Mahathir, 92, said in an interview with Reuters last month that embezzlement and bribery with government money were among the charges that Malaysia was looking to bring against Najib, 64, adding they had “an almost perfect case” against him. Najib’s arrest was in relation to a probe into SRC International, a former 1MDB unit, a task force investigating the fund said. He is due to be charged in court on Wednesday morning. Sources close to the matter said he may face several charges. Anti-graft agents picked up Najib from his home after serving him with a remand order, sources close to the family said. A Najib spokesman did not immediately have a comment and Najib has consistently denied wrongdoing. Najib came to power in 2009 and soon after founded 1MDB which is being investigated in at least six countries for alleged money laundering and graft. The scandal around 1MDB plagued Najib’s second term in office, eventually leading to the ousting of a coalition that had ruled Malaysia since its independence from Britain in 1957. Three years ago to the day, the Wall Street Journal reported that Malaysian investigators traced nearly $700 million of 1MDB money into Najib’s personal bank account. Najib insisted the funds were a donation from a Saudi royal. The former head of Malaysia’s central bank said on Tuesday that in 2015 Najib asked her to issue a statement saying “he had done nothing wrong in his account” which she declined. The initial focus of the Malaysian Anti-Corruption Commission (MACC) investigation has focused on how 42 million ringgit ($10.6 million) went from SRC International into Najib’s account. Malaysian police say they have seized nearly $275 million worth of jewellery, handbags, watches and cash from premises linked to Najib, while authorities have frozen more than 400 bank accounts as part of the 1MDB probe. Najib’s wife, Rosmah, has also been quizzed by anti-graft investigators in relation to 1MDB and Najib’s stepson, Riza Aziz, was giving a statement to the MACC when news broke of Najib’s arrest. Riza is the co-founder of Red Granite Pictures, a company that U.S. prosecutors say financed three Hollywood films, including the 2013 Martin Scorsese movie “The Wolf of Wall Street”, with funds misappropriated by 1MDB.